I hope we all take the time to introduce ourselves to each other. Reach out... enjoy the company of the others who are leaning toward IT architecture. TOGAF - an Open Group Standard, is a proven Enterprise Architecture methodology and framework used by the world's leading organizations to improve business efficiency. Zachman - The Zachman Framework™ is a schema best understood by reading many of the artifacts made available by Zachman International. There are a number of groups, professional associations, etc. involved with developing and forwarding the practice of IT architecture. The ones I see most important to developing an IT Architecture association are as follows; (I am open to discussing more than these five groups when it comes to how we align the association, everything that deepens architectural understanding is good for all of us). ISC - Vendor-neutral education products, career services, and Gold Standard credentials to professionals. There are many roles for the IT Architect. And they all have a place in getting projects to finished... When you read over the different group sites (above) you will begin to get a sense there are a lot of definitions for architects. Listed below are how I see the collection of different architecture role definitions. Solution Architect - focused on the architecture for a particular solution built to meet a defined business need and / or business strategy. Enterprise Architect - aligning IT architecture with business strategy. More focused on governance. Application Architect - specifying the architecture for a particular software application. Differs from Solution Architect in that the application is for a specific business domain, where the solution architect is focused on a business need and evaluates many applications to fulfill the need. Component Architect - designs and architects complex and mission critical software components. Technical Architect - takes on the technically challenging aspects of engineering a software solution. Optimizes the design for reuse, performance, etc. Database Architect - specializes in architecting data storage solutions. Infrastructure Architect - focused on the server, networking and infrastructure architecture. Security Architect - focused upon all things security within IT. 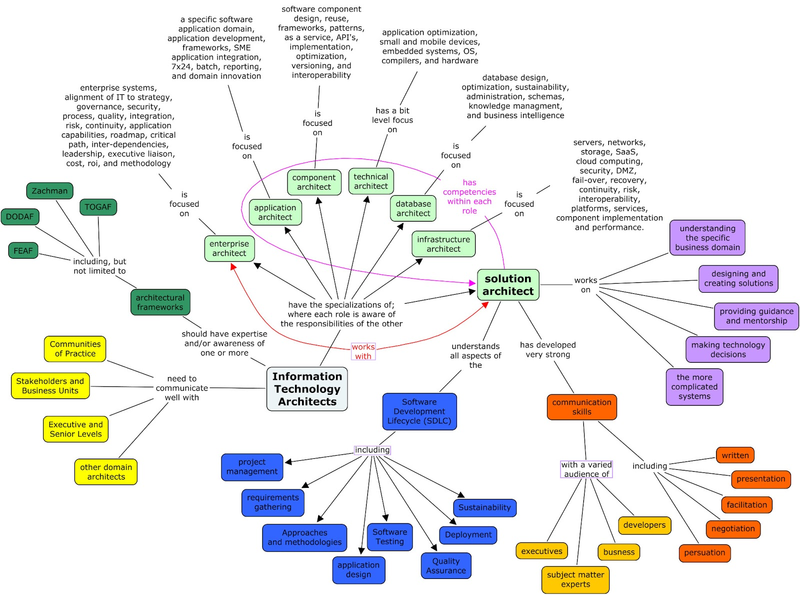 Information Architect - organizing and architecting information for usability. Business Architect - plays a key part in shaping and fostering continuous improvement, business transformation business innovation initiatives. Preparing for the Google Hangout. Informative post!! Happy to know about architecture. Have to arrange my office meeting too very soon. Planning to book one of reliable meeting space San Francisco for it. Have heard from a friend that the venue is really good and provides best services.